Though we are a publisher of children’s books, part of our mission is to look at diversity issues with a critical eye and see whose stories are not being told. As part of that mission, over the next several months we will be looking at several different arenas and talking to experts to see if patterns of inequality repeat themselves in different places. We hope our research will cast a light on the challenges – and opportunities – facing women and people of color today. Since the Tony Awards will be presented on June 9, 2013, we decided to collect some data to see if a diversity gap exists in the theater. See our infographic above. While we cannot claim expertise in other fields outside of children’s books, we were fortunate to receive valuable insight from playwright/actor Christine Toy Johnson, who has spent the last fifteen years conducting dialogue with the entertainment industry to increase diversity in the theater and beyond. How old were you when you knew you wanted to perform onstage? I can’t remember an age when I didn’t want to perform onstage. I was the kind of kid who made my parents’ holiday guests watch my dramatization of “The Twelve Days of Christmas” every year. I started working professionally (and joined Actors’ Equity Association) the summer I graduated from high school, and against all odds, I have made my living in the arts ever since, as both an actor and a writer. Since you have been involved in the theater for so long, how have you seen the theater world change? Do you feel that the number of roles available to people of color has increased over the years? Things have gotten better for people of color, for sure, but there is obviously a lot of room for improvement. I want to preface all of this by saying that I can only really speak from the perspective of being an Asian American actor and writer. I can’t presume to know what it’s like to be African American, Latina, Native American, etc., but the stats I’ve included from AAPAC (see below) will be able to address this question from a more objective point of view. Back in 1991, I got a chance to play Julie Jordan in a production of CAROUSEL at the Hangar Theatre in Ithaca, New York, which was a watershed moment for me. Not only was I shocked that I was being given the opportunity to audition (back then, a rare occurrence), but after I booked the job, working with a director and company of actors that supported me and believed in my ability to transform into a non-Asian character in a classic golden age musical gave me the confidence to go for and go on to play many, many more classic non-Asian leading lady roles. The power of encouragement and affirmation from your peers cannot be underestimated. As a playwright/librettist/lyricist, I am also acutely aware of the number of writers of color that are being produced, which is a key part of this puzzle. (More on that in a later question.) Personally, I am conscious of always either including an Asian American actor in my written work or telling an aspect of an Asian American character’s story. I believe that the only way we’ll see our roles increase is if more of our stories are produced (written by and/or about us), and/or if more playwrights/directors/producers are open to having people of color play non-race specific roles they write/direct/produce. • On New York City stages during the 2011–2012 season, African American actors were cast in 16% of all roles, Latino actors in 3%, Asian American actors in 3%, and other minorities comprised 1%. Caucasian actors filled 77% of all roles. Caucasians continue to be the only ethnicity to over-represent compared to their respective population size in New York City or the Tri-State area. • The percentage of minority actors rose to 23% this past year, a 2% increase from the year prior. While a significant jump, this level is fairly consistent with levels of minority representation which have consistently remained within the low twenty percent range. The last time representation hit 23% was during the 2007/08 season. • African American actors increased by 2% compared to last season. • Latino actors remained at 3% for the third straight year in a row. • Asian American actors increased slightly from 2% to 3% this past season. • Only 10% of all roles played by minority actors were non-traditionally cast. This remains the same as last season. • African Americans were far more likely than any other minority to be cast in roles which were not defined by their race. • For the second year in a row, the not-for-profit sector lagged far behind the commercial sector when it came to hiring minorities. The opposite was true in the four years preceding this shift, where actors of color were once more likely to find employment within the not-for-profit sector. While total number of minority actors in this sector increased by 3% from 19% the year prior, this is still far below the industry average and is the second year in a row that minority employment among the not-for-profit companies fell below 20%. • This past season, African Americans and Latinos on non-profit stages increased 1% and 2%, respectively. Asian American actors, however, have been at their lowest point, 2%, for three years in a row now. This is a substantial drop from where they were six and five years ago (4% and 7%, respectively). I recall seeing an off, off Broadway rock musical in 1999 called Making Tracks. I recall the play being a pride and joy of the Asian American community, but it never made it to Broadway. Do you feel that plays by playwrights of color have a tougher time making it to Broadway? No Asian American female playwright has ever been produced on Broadway. Ever. (An Asian Canadian female writer was produced in 1904, but that’s the closest we’ve come. In 1904.) And with the exception of David Henry Hwang and Rajiv Joseph, not many Asian American male playwrights have been produced on Broadway either. One of my theories as to why Asian American playwrights are not often produced is that many producers seem more interested in hearing “Asian from Asia” stories (more comfortable with keeping us in view as the perpetual foreigner, subconsciously or not), and the many plays I have read/seen/discussed by the Asian American playwrights out there (and we exist, I assure you) might not be fitting that (again, conscious or subconscious) bill. As an interesting companion note, most Asian American actors who are employed on our NYC stages are not non-traditionally cast (there are exceptions, of course), and almost every reading and audition I’ve ever done for a major NYC theatre has been for an Asian character from Asia, not from America. I find this very telling, as to how we continue to be perceived. Do you feel playwrights and actors of color have established an off, off Broadway existence purely out of necessity because of how difficult it is to get a play produced on Broadway? It’s tough for anyone to get produced on Broadway, and I can’t even guess what Broadway producers are looking for. I do think that the Off and Off-off Broadway theatres historically have taken chances on less “mainstream” theatre/ideas/themes, but again, I’m not really sure what that means. Do you see a lot of people of color gravitating to work in the theatre? If so, what kind of life is waiting for them? What is the chance of them starring in a Broadway production? I have definitely seen a huge growth in people of color working in the theatre. Show biz is tough for anyone, but I’m a firm believer in going after what you want, with a clear eye and an open heart. To me, that means being cognizant of the odds, but having a commitment to changing them through unrelenting hard work, passion for the art, and forging creative responses to making a life in the theatre work for you (creating your own opportunities, staying on top of your game, advocacy, having balance, etc.). That said, the reality is that on Broadway, we are often relegated to the supporting roles (which are often great, but still! ), and with all the other things I’ve mentioned above, I believe, unfortunately, that the chances of an Asian American actor starring in a Broadway production are slim. There is also a vicious circle of producers wanting actors with TV and film notoriety to star in their Broadway shows, but because of the unevenness of access/opportunity in TV and film for actors of color, there aren’t as many TV and film “stars” of color to come take Broadway by storm. 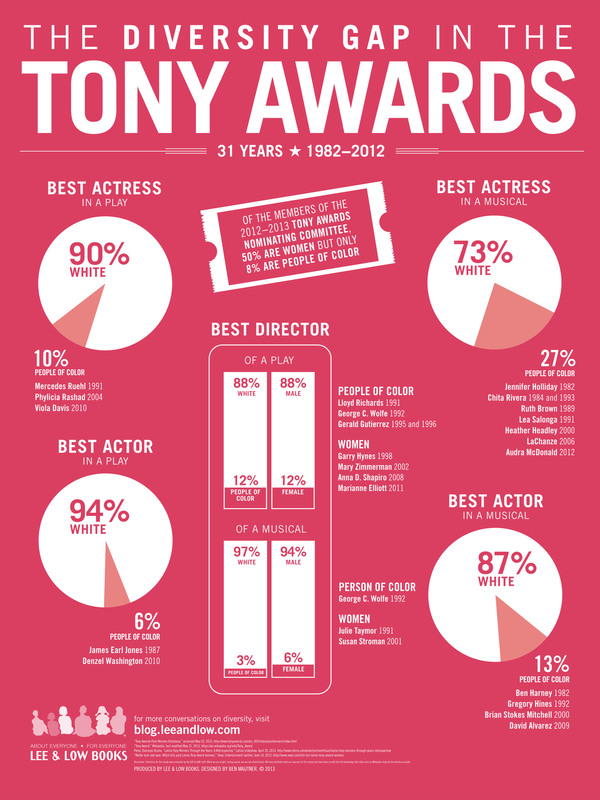 When you look at the Diversity Gap in the Tony Award statistics do these numbers surprise you? If not, what are some of the mitigating factors that contribute to explaining why the statistics look as they do? I have been a Tony voter since 1992, and have seen the make-up of almost every Broadway show for the past 21 years, so these stats do not surprise me at all. I think the problem lies both in programming (lack of writers of color being produced) and lack of non-traditional casting (lack of actors of color being cast in roles that are not culturally-specific, or presumed to be Caucasian). Again, a vicious circle. Few stories about us plus few opportunities to portray non-race specific roles add up to some pretty sad numbers. Who makes casting decisions? The director? Writers? Casting directors? Are there certain people you know who will make casting decisions that are slightly outside the box? Have you seen situations where a part that was not originally written for a person of color in mind is given to person of color? board of Alliance for Inclusion in the Arts, being co-chair of Actors’ Equity Association’s Equal Employment Opportunity Committee and sitting on various diversity committees with various parts of the industry engaging in dialogue about these issues for the past 15 years or so), I’ve found that most everyone likes to pass the buck. I’ve heard everything from it’s the producers’ fault to it’s the directors’ fault, to it’s the playwrights’ fault, to it’s the actors’ fault for not showing up to auditions. At the end of the day, I believe that casting has to be a truly collaborative effort. An actor has to be up to the challenge, his/her agent has to submit/push for an “outside the box” suggestion, the casting director has to give that agent’s client an opportunity to be seen by the creative team, the creative team has to have an open mind to re-imagine the role, the producer has to set the tone and mandate to the creative team that he/she is writing the checks to back a production that’s committed to portraying the world through a wider lens. There are definitely people out there in the industry who are champions of diversity. And certainly there have been times when a person of color is given an opportunity to play a role that wasn’t originally written as race specific. In the current season, Ann Harada comes immediately to mind; she is playing one of the stepsisters in the revival of Rodgers and Hammerstein’s CINDERELLA. Two seasons ago, Janet Dacal played Alice in WONDERLAND. In BILLY ELLIOT, a few of the boys who played Billy were not Caucasian. Longer ago, Brian Stokes Mitchell played Don Quixote in the last revival of MAN OF LA MANCHA. At Actors’ Equity, I helped start an award in 2007 called “The Extraordinary Excellence in Diversity on Broadway Award’, in which we laud a production with the most noteworthy non-traditional casting each season. We have honored The Roundabout’s production of 110 IN THE SHADE (with Audra McDonald playing the female lead, traditionally Caucasian), the revival of LES MISERABLES (with Norm Lewis, Ali Ewoldt, and Adam Jacobs among those non-traditionally cast), BILLY ELLIOT, AMERICAN IDIOT, THE MERCHANT OF VENICE, and the recent all African American cast revival of A STREETCAR NAMED DESIRE. There are certainly years when the nominees have been harder to come by than others, but we are intent on celebrating instances of diversity on Broadway when it does happen, to bring more visibility to their success. In your mind, what kinds of changes would need to take place to address the Diversity Gap in the Tony Awards? 1. Programming. 2. Non-traditional Casting. 3. Access. (Everyone wants “the best person for the role,” But if we’re not even allowed a chance to audition, how do they know that “best person” isn’t us?) And (perhaps at the root of all of this) is 4. We need to expand the perception of who people of color are/look like/can do, and how we fit into the American landscape of storytelling. My own ancestors first set foot on American soil in 1862. Ever since then, we’ve been entrepreneurs, taxpayers, voters, volunteers, and good responsible citizens. Heck, I was even a cheerleader in high school. As far as I’m concerned, I’m as “all American” as the blonde, blue-eyed girl next door. And I still can’t understand why the theatre, whose power has always been in holding a mirror up to society, doesn’t quite reflect me. Thank you, Christine for this honest and rare glimpse into the theater world and its precarious relationship to diversity. While I personally have no knowledge of the theater outside of being an appreciative audience member, when I read Christine’s answers to our questions, I was not surprised. Christine’s experiences in the theater world mirrors our own efforts to bring our books to a wider audience. The Diversity Gap in the Tony Awards study was an eye opener. It confirmed that our struggle is not an exclusive one and that it extends beyond the world of children’s books. My point to both groups was that children want to “put” themselves in books. Over the years, I have heard several African-American authors and illustrators remark that this was the reason they began to write — so that other children could “see” themselves in books. It is up to librarians and teachers to seek out materials that do this and to balance what they use so their students are exposed to other cultures/lifestyles, at the same time. While growing up during the Civil Rights, I began to see a trickling of books featuring African-American children (Ezra Jack Keats’ books come to mind, though he was not African-American, he wrote about inner city kids). Children’s reading textbooks began to include illustrations of African-American children about this time. I remember in 1977 when the Dillons won the Caldecott for Ashanti to Zulu and Taylor won Newbery for Roll of Thunder, Hear My Cry, a lot of people called it the “Roots” Effect (from a rise in awareness of African American heritage, political upheaval on the African continent). We began to see a rise of books about African-Americans being published at that time. In the late 1980’s, I was seeking books about Latino/a and Asian-American children when working in California, where 49% of the city’s population was white and the majority were either Latino/a or Asian-American — with limited success finding many books on either group. Since the 1990’s, I have noted more in the way of diversity in publishing, however it is still a small percentage of the total amount that is published each year. There is some African-American, some Latino, some Asian, and a smattering of some Middle Eastern. I applaud and laud your efforts on this front! And proudly proclaim you as one of my publishing heroes. The diversity gap is an interesting study and we do have other studies in the works that will show a consistent, if not unsettling trend across media in general. It was important to show that the gap extends beyond publishing, which may explain in and of itself why the gap exists in the first place. If there is a societal problem of inequality for women, for people of color,does it indicate that the powers that be do not want these factors to change because it is not in their best interests? We are talking about substantial blocks of time. The Tony Award study is 31 years. Certainly enough time for the needle to move more than it has. Patrick Healy nailed this one. Hopefully those that hold creative decisions will take this to heart and take action! I think it is very exciting seeing the diversification in roles. What a challenge for actors to “make it their own”. Thanks for sharing the link, Jason. Pingback: The Diversity Gap At The Emmy Awards Is Staggering (INFOGRAPHIC) - Freshwadda Brooks | Coming Soon! Pingback: The Diversity Gap At The Academy Awards Is As Hugely Discouraging As You'd Expect (INFOGRAPHIC) - Freshwadda Brooks | Coming Soon!